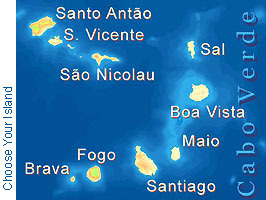 The smallest of the islandsof just 64 square kilometers is somewhat greener than the others. Its leeward position to the volcano of Fogo is responsable for frequently forming a cap of clouds protects the "island of flowers" from the mercyless heat of the Sahel sun. The little town of Vila Nova Sintra is located in a nice valley high above the sea, not to far from the highest mountain called Fontainhas. The climate is moderate, friendly and never to hot. The colonial masters of former times made it their summer-residence with all the attributes of nice little colonial town. 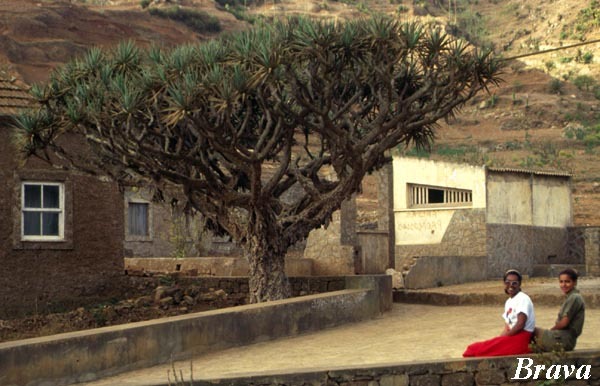 In Fajã das Águas the history of the Cape Verdean diaspora started in early 19th century. Up to one hundred whaling ships showed up in the beach every year and they hired poor fisher boys from the island, acustomed to the dangerous dance in little rowing boats on the open Atlantic. Excellent hiking trails cross the island and even the little roads are perfectly suitable for hiking and mountain biking MTB as traffic is close to none. Many trails follow old mule-roads. How to get there and how to get away is a delicate question. There is no airport and reliable and punctial ferry boats are still not available. But the situation is improving. Delays of a day or two may occur, due to the wind, the weather, the sea and the management of the ferries who are more interested in cargo than in passengers. So never plan your stay in Brava at the end of your vacation. At the very beginning it does not do any harm to get back a day or two later. Accommodation is found at Informação Turística - Lucete Fortes. Booking is made easy by our translation-communication service. A virtual hike down to Fajã d' Água above sea level) is what you should undertake next.